June was a big month in and out of the Wolfstar office, we celebrated a special birthday by going gin tasting, we visited The Future of Influence Conference in London and the fantastic SearchLeeds at the firstdirect arena. All of this whilst managing to not get too carried away that football, is indeed, coming home! 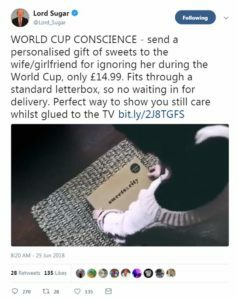 So, here’s some of the big PR and social media stories that may have passed you by whilst you’ve been a) watching football b) enjoying the sunshine or c) watching the football in the sunshine. Speaking of the World Cup, here’s an example of another public figure who might want a bit of advice on how to use their social media channels. 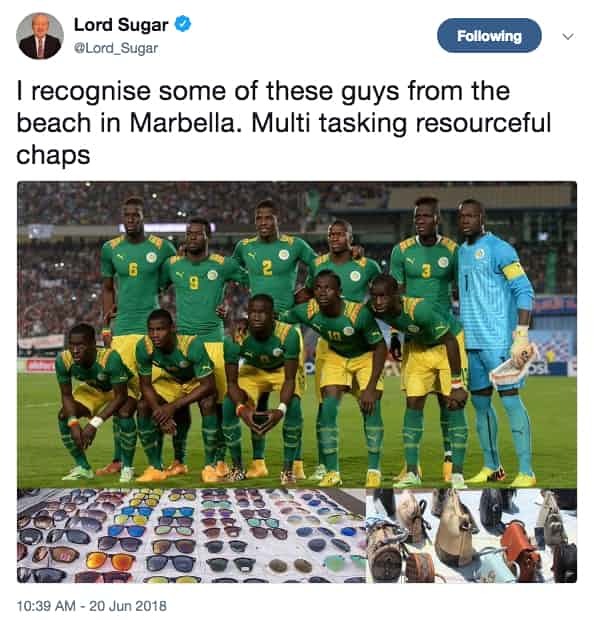 Lord Sugar came under some scrutiny after a very poorly thought out joke about the Senegal national team. Not content with being accused of racism, the famous entrepreneur also tried his hand at a bit of casual sexism as well. We suspect if any of his staff were guilty of a gaff on this level, they’d almost certainly be fired! The juggernaut that is Instagram continued to expand its offering in June, this time with a challenger to YouTube. IGTV, allows users to share stories and videos that are much longer than it had previously allowed. An hour long to be precise. Before this update users could only share videos that were one minute long, which was increased from 15 seconds in 2016. IGTV is a standalone app, as well as being embedded in the original Instagram app. The creators have described it as “a new app for watching long-form, vertical video from your favourite Instagram creators”. It will be interesting to see how influencers, brands and agencies make the most of the extra 59 minutes. Learn more about this exciting new development here. Unilever has declared it will make a considerable effort not to work with any influencers who have fake followers or those who have used bots to grow their following. The company has called on others in the industry to shun influencers who have used underhand tactics to falsify their true reach and influence in a bid to eradicate these unethical practices. Follower count has become a major barometer for lots of brands looking to work with influencers to promote their products. However here at Wolfstar we stress the importance of engagement when working out who are the best people to work with. Influencers with a high engagement rate are often those with an organic following. We’re keeping a close eye on this story to see how it develops and how other companies might tackle the growing ‘fake follower epidemic’. Read the story in more detail here. The government could be about to impose a ‘social media curfew’ on children, the EU voted on a new copyright law which could change the internet, social media and our industry forever. And Stranger Things star, Millie Bobby Brown quit Twitter after a malicious meme was made about her. 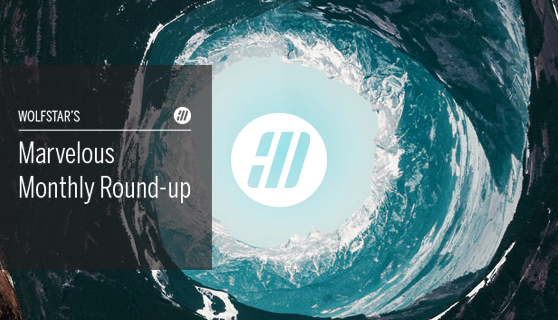 See you next month for another roundup of the biggest and the best news in PR and social media.